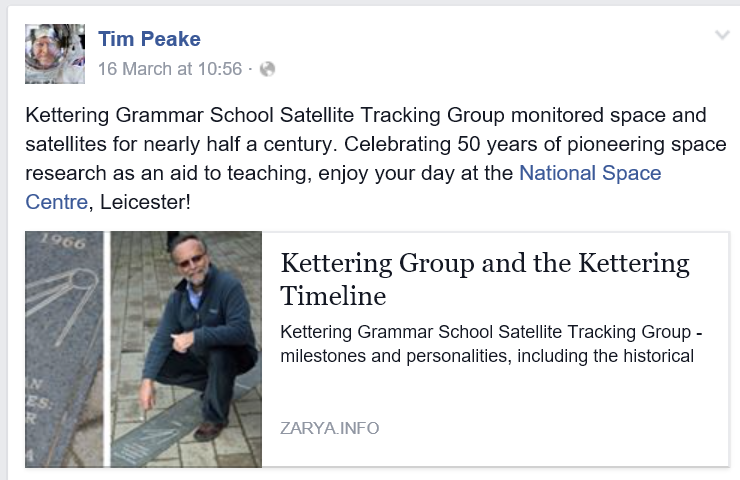 Derek Slater gifted a selection of tracking equipment to the National Space Centre at Leicester in the UK. It went on display early in 2016. 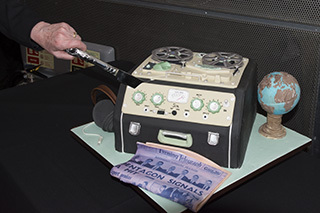 On March 16 that year nearly forty people associated with the group assembled at the Space Centre and celebrated inauguration of a display centred around the school tracking team's earliest radio receiver. The following day was March 17, the 50th anniversary of the first orbital launch from Plesetsk. The group included twelve former schoolboys from Kettering Grammar School (later Kettering Boys' School), some of whom actually operated the equipment on display. Left to right are: Darren Conway, Ian Reynolds, James Bambridge, Mike Sinnett, Bob Christy, Sven Grahn, Isabel Carmichael, Max White, Mary Slater, Stuart Ganney, Paul Rosser, John Kellett, Fritz Muse, Ian Wildman, Philip Perkins, David Muggleton, Terry McGrath, Charles Carmichael, Chris Wood. 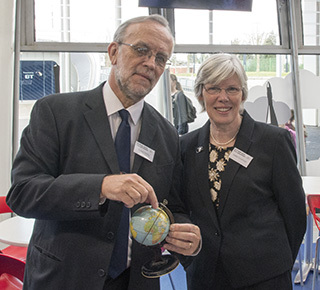 The photo is courtesy of the National Space Centre, Leicester. Some of the Group took part in a discussion, introduced by Alistair Scott, Past President of the British Interplanetary Society. The BIS had provided a platform for the Kettering Group to publish its observations in the 1960s and 1970s. It was at the BIS Autumn Meeting of 1967, when Geoff Perry and fellow Physics teacher John Marshall were giving talks, that the Daily Expre3ss and RACAL presented a brand new, state of the art, RA-217 receiver. Derived from a high specification military receiver, it retailed and about £1000. Panel members talked of the excitement at being involved in early events and the group's input to the world's understanding of the Soviet Space Programme. Panel members Sven Grahn, Bob Christy, Isabel Carmichael and Chris Wood were joined via Skype by Marcia Smith (inset), former researcher and analyst with the US Congressional Research Service, and now a US space policy consultant. There was a good selection of Kettering Group neckties and brooches on view. The exhibit was unveiled in the Space Centre's Rocket Tower. 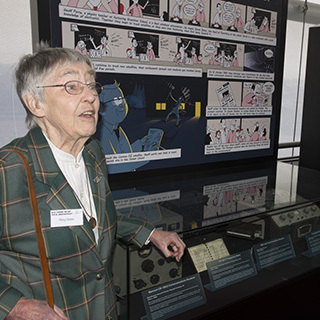 Here, Mary Slater introduces a crowd of onlookers to the equipment on display while reflecting a little on the 50 years plus that have passed since Derek Slater and Geoff Perry first set up a tracking staion at the school. In the cabinet can be seen the original Marconi CR-100/2 radio receiver and the BC-221 frequency meter need to keep the receiver in tune at the Russian radio frequencies around 15-20 MHz. 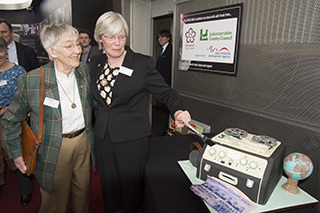 Mary Slater and Isabel Carmichael (Perry) cut the first slice of the cake based on the Team's Ferrograph tape recorder. The real thing, to be seen in the display case alongside the Marconi receiver, cost £100 in 1967. That's equivalent to £1500 - £2000 in today's terms. This is the Tracking Group's first computer - analogue of course. Bob Christy and Isabel Perry are with a small globe encicled by an orbit made out of thick wire (lots of the world still coloured red!). It served to show where a satellite was travelling while radio signals were being received. It could also be used to work out from orbital data whether a satellite would actually rise above the horizon. The Earth turns under the orbit and the orbit inclination can be set to match the satellite being tracked. It is set up to show a 65° inclination orbit passing over Plesetsk as it would would be at launch time for one of the 'eight day wonder' Cosmos satellites on which the team cut its teeth. After the Space Centre event, the group retired to a local restaurant for the evening to reflect on the day and exchange memories. The nature of the Tracking Group was such that it went through several generations of school pupils, each staying 2-3 years before moving on in their education. It meant that some people were meeting in person for the first time. They may have known each others' names but had never been in the same room before. Others were renewing acquaintances after many years. The enthusiasm generated by belonging to a group that was at the cutting edge for so long lives on. It has generated a new drive to ensure that the remainder of the tracking equipment and the archive of observations and analyses finds a home where it can be opened up for research. There is certain to be new information to be discovered, locked up in the records of many years of painstaking logging and recording.